The Single Anastomosis Duodenal-Ileal Bypass with Sleeve Gastrectomy (SADI-S) is also known as a One Anastomosis Duodenal Switch (OADS). This is a recent (2007) procedure that modifies and combines both “Bileopancreatic Diversion (BPD) (an old established operation 1979)” with a “Duodenal Switch (DS) (established in 1986). 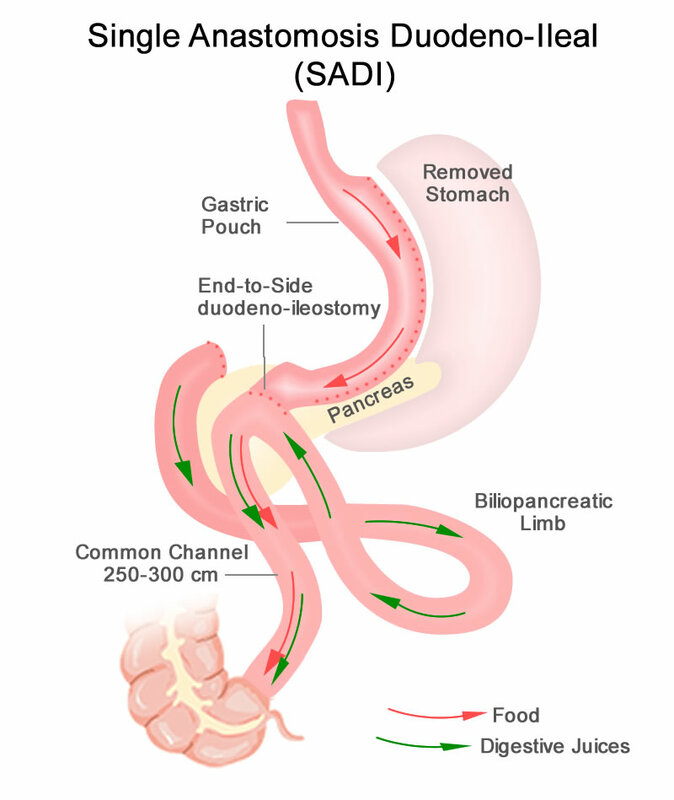 SADI-S (2007) essentially simplifies the “two” anastomosis (performed in BPD and DS) into “one”. This join is in a form of a “loop”. This procedure joins the duodenum (just passed the stomach) to the loop of ileum, which is about 200cm from the origins of the large bowel. This creates a significant malabsorption. Lacking robust data (follow up and long term data). Currently considered as an “Investigational” procedure and NOT a recognised “Main-stream” procedure. The procedure is considered “safe” and “efficacious” in the current form (SADI-S0. Current concerns of insufficient long term data on nutritional issues.